A Tennessee vacation home provides a couple with a respite from the Florida heat and plenty of room for grandchildren. Hoping to escape the heat of Florida summers, Rick and Sandra Pfendler were considering vacation property in the mountains of northeast Tennessee, when coincidence delivered a brochure in the mail about property for sale on Douglas Lake. 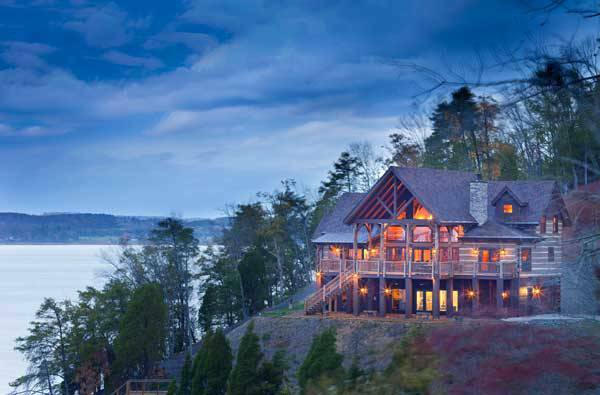 The Pfendlers’ hewn-log home is perched on the wooded shore of Douglas Lake in the northeast Tennessee. Nine of the couple’s 13 acres lie in the water. Cypress trees felled on the property during site preparation support the home’s covered decks. The home’s walkout basement comprises a wide-open recreation room and storage space. They decided to check it out. "I told the salesperson we were interested in a dockable point lot, " Rick recalls. "There was a parcel available that looked promising. Interestingly, in order for us to have water rights for the dock, we had to purchase a total of 13 acres, of which only four acres were not in the water. This didn’t deter us, as the location was perfect for what we had in mind." As a builder of custom high-end homes, Rick was familiar with the concrete-type construction common to Florida, but he knew nothing about log construction, which is what he and Sandra wanted for their vacation cabin. They felt logs would not only fit with the heavily wooded lot, but also be a complete change from what they were accustomed to in the Sunshine State. Rick investigated several log-home companies, and after visiting the home of Randy Giles, president of Hearthstone Homes, chose that Dandridge, Tennessee, company. A big plus was that it offered a turn-key product. "This was critical for us, as I couldn’t take time from my business to be onsite during the construction," Rick says. For an old-timey cabin look, the Pfendlers favored Hearthstone’s Bob Timberlake Collection, which utilizes eastern white pine square logs. "Each of the handcrafted logs varies from 14 to 24 inches, depending upon the diameter of the tree, and is flattened on two edges," Hearthstone project manager Jobe Leonard explains. "The other sides are left with their natural profile. This closely mimics the style of construction used by the country’s early settlers." Cypress trees felled during excavation provide the support for the covered decks of the Pfendlers’ home. 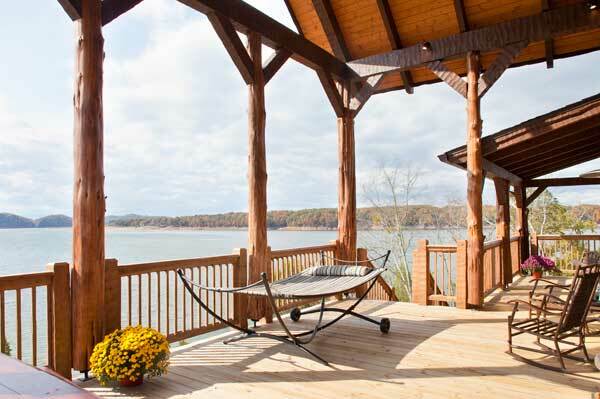 Pressure-treated decking is both beautiful and maintenance free, perfect to bask in the warmth of an autumn Tennessee day and enjoying the view up and down both channels of Douglas Lake. The Pfendlers selected one of Hearthstone’s basic floor plans and began making modifications. Rick’s construction background allowed him to examine the plans and revise the window and door sizes to better fit the couple’s needs. "One of the major changes we made," Sandra notes, "was to move the laundry room to the walkout basement so that we could have his and her closets in the master bedroom." Their chief consideration, though, was making sure the home had enough room for their three children and five grandchildren, ranging in age from toddlers to teens. They gained sufficient sleeping space by including three bedrooms with two full baths, a loft office with a daybed on the second level and an additional sleeper sofa in the game room. Sandra designed the kitchen with her stepdaughter and two daughters-in-law in mind. There are workstations next to the microwave, the refrigerator, sink and high bar, so that everyone can have their own space but still be close enough to visit while preparing meals. Sandra’s son is the family’s amateur chef and loves creating new culinary delights for the family. Sandra put her talents as an interior decorator to use to create a home that is softly traditional. 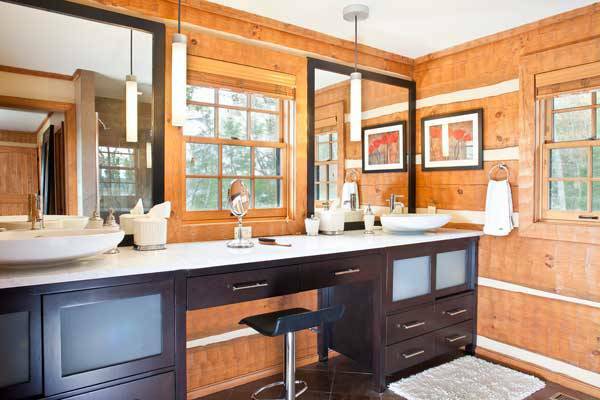 "When we started considering a log vacation home, I began subscribing to log and mountain home magazines," she explains. "I would pick out ideas that I wanted us to incorporate into various rooms, especially the kitchen and bar," Sandra says. "I advise my customers to follow this plan so they won’t be starting from ground zero when it comes time to finish the interiors of their homes." To complement the logs, she added upholstered and leather furnishings. "I selected different rustic lighting fixtures for each of the rooms to give each one its own personality," she says. "I had so much fun picking out fixtures with different mountain themes such as bears, deer, antlers and trees." A favorite feature of the home is the reclaimed heart pine floor, which uses boards 9 to 11 inches wide. "Not only does the floor have the very distressed look we felt would contribute to the age-old feel of the cabin, but also the machinery oil used in the old mill preserved the wood to give it a rich finish," Sandra explains. "It is just exquisite." Landscaping is an ongoing project, Rick relates, and they continually add to the already established native plants. Because Sandra wants color year round, the Pfendlers have included flowering trees, such as dogwoods and magnolias, and white birch to contrast with the brown and gray bark during the stark winter months. A sprinkler pump allows them to draw water from the lake to irrigate the vegetation. For outdoor family fun, Rick built a horseshoe pit outside the walkout basement. Farther down the hill, he added a fire pit where they like to gather on cool evenings and roast marshmallows. To allow them to enjoy the beautiful Tennessee mountain scenery and the view of the lake, the couple included a large porch, three-fourths of which is covered. It is accessible from the living room, dining room and master bedroom. As a housewarming gift, Hearthstone gave the Pfendlers a picnic table and benches, built in the same pegged style as the home’s construction, where they can gather their family for al fresco dining. Sandra wanted the master bath to have a relaxing spa feeling. Frosted glass in the bypass cabinet doors in the custom cabinets, vessel sinks, and natural slate on the floor and shower add to the stylishness of the room. Double-hung windows are trimmed in hand-hewn pine. Their vacation home provides far more than escape from the heat. "When I am in Florida, I work from 5 a.m. to 7 p.m. at my business," Rick says. "Even though I still get up at the same time here in Tennessee and do some work, this is different. Here, I feel relaxed. We can have our coffee on the porch and watch the birds in the sky and the fish jumping in the lake." Sandra concurs: "We so look forward to going to Tennessee. Just talking about our vacation cabin there makes us long to be there. It is where we can kick back. It is truly our sanctuary."